"Cuties," what a perfectly suitable marketing name for the California Clementine. As if the name "Clementine" wasn't adorable enough on its own, right? Cuties California Clementines--now that's a mouthful and a cute overload, but quite frankly, I don't mind a bit! 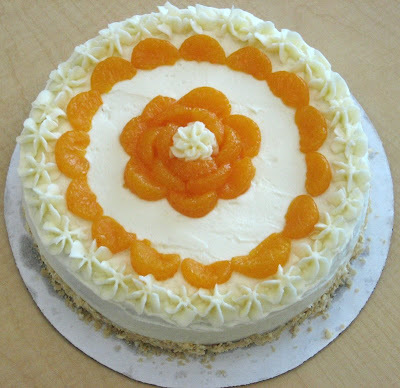 I was thrilled when Stephanie requested a birthday cake with which to surprise her boyfriend, Mitchell, giving me free reign to bake as I wished, so long as it included Clementine oranges, which he loves. 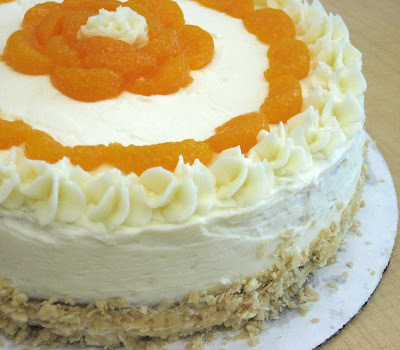 Since Clementines are a variety of mandarin orange, I made sure to include mandarins aplenty in this cake, which I've lovingly named, "My Darling Clementine." Two buttery bourbon vanilla cake layers sandwich a generous filling of mandarin orange slices before being frosted with a light Grand Marnier buttercream. Mandarin slices are arranged on top inside a border of Grand Marnier buttercream stars, and crushed vanilla pirouette cookies add a touch of crispiness. Lots of bourbon. Lots of orange. Lots of vanilla. And a whole lot of yum. So what is up with this trend of making overly cutesy cakes for male recipients (as seen here, here, and here)? I don't have a clue, much less an explanation. Bear with me, fellas! Macho cakes are a work in progress.